The perfect all-in-one travel solution, LingvoSoft Travel Suite English <-> Japanese Romaji Kanji for Windows Mobile provides everything needed to make business travel more successful and leisure travel more enjoyable. A unique combination of speech-enabled translating dictionary , a talking travel phrasebook , this resource for Windows Mobile delivers practical information you can count on when visiting another country. The perfect all-in-one travel solution, LingvoSoft Travel Suite English <-> Japanese Kanji Kana for Windows Mobile provides everything needed to make business travel more successful and leisure travel more enjoyable. A unique combination of speech-enabled translating dictionary , a talking travel phrasebook , this resource for Windows Mobile delivers practical information you can count on when visiting another country. LingvoSoft Talking Dictionary English <-> Japanese Romaji Kanji for Windows Mobile is a fast and convenient translating dictionary that travels wherever you go. As part of a complete language learning and management solution for your Pocket PC it delivers instant bi-directional translation of all the words and phrases in its massive database. As one of the most sophisticated language resources available for Windows Mobile it supports Square screens, High Resolution screens and along with being Windows Mobile Version 5.0 compatible it also allows for screen rotation to make it comfortable to use under any circumstance. 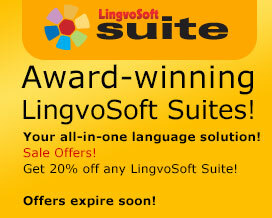 LingvoSoft Learning Voice PhraseBook English <-> Japanese Romaji for Windows is a remarkable application that makes learning another language easier than ever before. Part of a revolutionary suite of language learning resources for your PC, it provides you with 14,000 travel-oriented phrases and instantly translates in either direction between English and Japanese Romaji. LingvoSoft Learning Voice PhraseBook English <-> Japanese Kanji for Windows is a remarkable application that makes learning another language easier than ever before. Part of a revolutionary suite of language learning resources for your PC, it provides you with 14,000 travel-oriented phrases and instantly translates in either direction between English and Japanese Kanji. LingvoSoft Learning Voice PhraseBook English <-> Japanese Kana for Windows is a remarkable application that makes learning another language easier than ever before. Part of a revolutionary suite of language learning resources for your PC, it provides you with 14,000 travel-oriented phrases and instantly translates in either direction between English and Japanese Kana. LingvoSoft Talking Dictionary English <-> Japanese Kana Romaji for Windows is part of a complete language learning and management solution for your PC. Providing instant bi-directional translation of all the words and phrases in its massive database, it is one of the most complete language resources ever designed. Once installed on your desktop or laptop PC this remarkable dictionary not only translates between English and Japanese Kana Romaji but also speaks the translations out loud using the latest TTS (text-to-speech) technology.